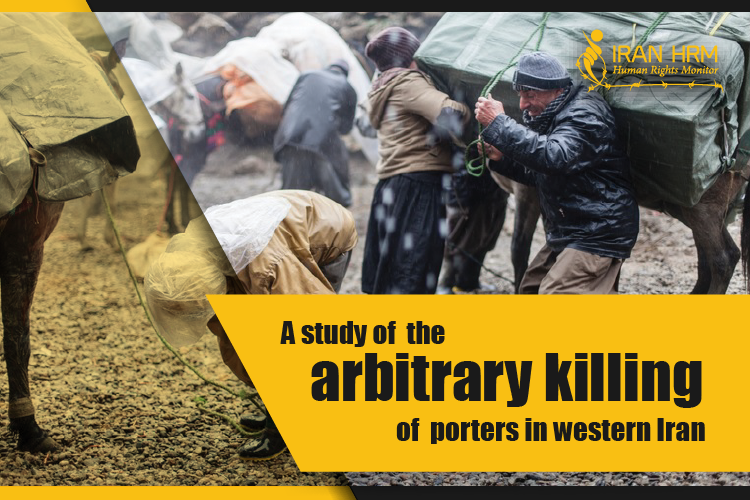 Every year, hundreds of unarmed porters are killed or injured by Iranian security forces near the western borders of Iran mainly in the provinces of Kurdistan, West Azerbaijan and Kermanshah. The killing of porters has dramatically increased in recent months. At least 16 back carriers and petty tradesmen have been killed and 12 wounded only during the months of July and August. This is while 49 got killed and 47 wounded throughout 2016, meaning an average of four porters killed per month. Killing of porters, as the poorest people who have to resort to this type of hard work to make ends meet for their families, has sparked a wave of outrage among the public. In protest to these killings by Iran’s Revolutionary Guards and the State Security forces, demonstrations broke out in the western city of Baneh. A large number of residents gathered outside the Governor’s Office on Tuesday, September 5, demanding an end to the ongoing attacks against the porters. Back carriers are poor people who transfer goods such as fuel, cigarettes, electric equipment, clothing, tires, etc. with great difficulty and at a high risk to their lives to earn a living for their families. They sometimes have to transfer 100 to 150 kilograms on their backs in the mountains and valleys, in hot summer or cold winter. More than 68,000 porters are working in Iran’s border provinces, of which 16,000 to 18,000 are in Piranshahr and Sardasht, official statistics indicate. Unofficial sources however estimate the actual number of porters to be around 350 to 500 thousand in border provinces. Border porters include children, youths and the elderly. In addition to natural disasters such as avalanches and frostbite, or accidents like drowning in the river or falling into the valleys, they are constantly threatened by direct shooting of the regime’s security forces. The State Security forces target the porters without any prior warnings under the pretext of “fighting trafficking of goods,” a practice which is in contravention of the law. According to Article 3 of the Law on the Use of Weapons by the State Armed Forces, the SSF shall not use firearms against persons except in self-defense or defense of others against the imminent threat of death or serious injury. Based on the above law, experts and lawyers argue that firing at Kurd porters is in violation of the law. According to the Islamic Punishment Law, the crime of these porters amounts to “smuggling” and sometimes “illegal transition across the border,” which are punishable with a few months of prison sentence or payment of fine. He had already pointed to “systematically killing” of the porters and their severe conditions. “Indiscriminate killings of kulbaran (border couriers), in violation of the domestic laws and international obligations of the Islamic Republic of Iran, continue to be reported. Human rights organizations report that at least 70 border couriers were killed and 68 wounded by government forces between March 2011 and April 2012. These reportedly unarmed couriers from the Kurdish-dominated provinces appear to engage in smuggling such items as tea and tobacco because of inadequate employment opportunities,” the report reads in part. This pressure on the deprived people comes while over $20 billion worth of smuggled goods enter the country annually which amounts to one third of country’s official trade. It is crystal clear that such massive volume of systematic smuggling and import of goods to the country is carried out through organized networks and government-backed institutions such as the Revolutionary Guard Corps who are in charge of the country’s security and control a large part of the economy, trade, import and export. At a press conference in London on March 7, 2017, the Iranian resistance(PMOI/MEK) blew the whistle, revealing that 90 Iranian ports, which amount to 45% of the total number of ports in Iran, are used for massive smuggling efforts. These ports are mainly at the disposal of the IRGC. The following figures have been extracted from the state media and official government announcement to reflect the extent of persecution of border couriers. The State Security Force targeted two Kurdish porters on the night of June 23, killing one and wounding the other. The identity of the killed porter is Morad Arabi, a 34-year-old father of three. Kardin Arabpour was also severely wounded. The State Security Force targeted a group of border porters on June 22, killing one and wounding two others. The identity of the killed porters is Mohammad Masaeli Fard who was the father of three children. The two wounded porters were not taken to the hospital for fear of arrest. At least four porters in the border region in Urmia were wounded after border forces opened fire on them on July 4. According to reports, another porter from Sardasht was killed from a bullet wound after a week in hospital. He was identified as 23-year-old Zawar Mohammadi. One Kurdish porter identified as Amir Khaledi was killed and three others were wounded after Revolutionary Guards Corps opened fire on them in the Kurdistan region on July 20. A Kurdish porter died after being shot at directly by security forces on July 25. He was identified as Karim Mohammad Aminzadeh. An informed source said that he was shot without prior warning. A Kurdish porter was severely wounded by border security forces in Maku on August 6. The State Security forces shot to death a 17-year-old Kurdish porter on the night of August 20. He was identified as Vahid Dolatkhah Janikanlo. A group of Kurdish porters were targeted by security forces on July 29. One porter was killed while two others were severely wounded. The deceased porter was identified as Ibrahim Mahmoudi. A Kurdish porter was fatally shot by security forces on August 7, near the Kani Danial Village. He was identified as Mohammad-Baher Gheitouli.